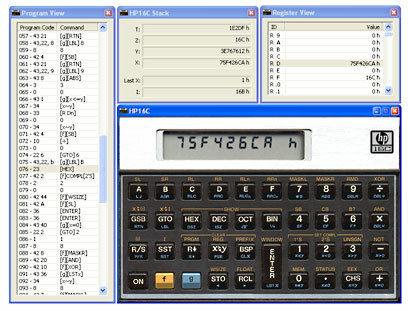 The HP16C Emulator is a software simulation of the original HP-16C Computer Scientist calculator, made by Hewlett-Packard during the 80's, but now discontinued. Note that this site, the software and the author have no connection whatsoever with Hewlett Packard. 26-NOV-18: We are using a new shareware merchant, ShareIt - MyCommerce to handles sales for the HP16C Emulator. The price has been discounted further. 29-NOV-09: Version 2.1 of the HP16C Emulator has been released! This is a free upgrade for all owners of Version 2.0. If you purchased the HP16C Emulator and did not receive instructions about obtaining version 2.1 please contact support AT hp16c DOT net (remove spaces and replace with '@' and '.'). 06-APR-08: Version 2.0 of the HP16C Emulator has been released. This is a free upgrade for all owners of Version 1.4. If you purchased Version 1.4 and did not receive instructions about obtaining version 2.0 (because your email changed or you have over-exuberant spam filters, or whatever...) please contact support AT hp16c DOT net (remove spaces and replace with '@' and '.'). The HP16C Emulator will operate under Windows 2000, Windows XP, Windows Vista, Win 7, Win 8.x and Win 10 . The price for a License is $24.95 $14.95 USD (Limited Time Special). This calculator uses Reverse Polish Notation (RPN), an operating logic that involves the use of the ENTER key. This eliminates the need for parentheses in calculations, instead operations are performed using a memory stack. Extensive floating point calculations, plus Square Root and Reciprocal. Programming can be done in both modes. The emulators continuous memory retains data and program instructions until reset. There is an Index Register which can be used for loop counts, and logical tests that can be used for conditional execution. Completely configurable computer keyboard mapping. Save and Load Programs as either binary or text. Save and Load complete internal calculator state. If you wish to try out the HP16C Emulator, please download this 30 day TRIAL version. Double-click on the icon to begin installation. There is condensed documentation installed with the program. If you wish to purchase the HP16C Emulator 2.1, or want more information: Purchase. Please add any comments or questions to the HP16C Forum section.